Car is a 61 with LED taillight lenses. And so did driver side brake lights but not passenger side. So out came the test light and a 40lb dumbbell on the brake pedal. Pass side brake light works but driver don't. With a Proven ground there's no power to the driver side pig tail. I made sure brake switch was plugged in well and I plunged the switch several times by hand. I'm not real good with wiring so use simple terms. It could be the signal light switch. Here is how to check it. With the lever in the neutral position back probe the connector at the column, see picture, while stepping on the brake. 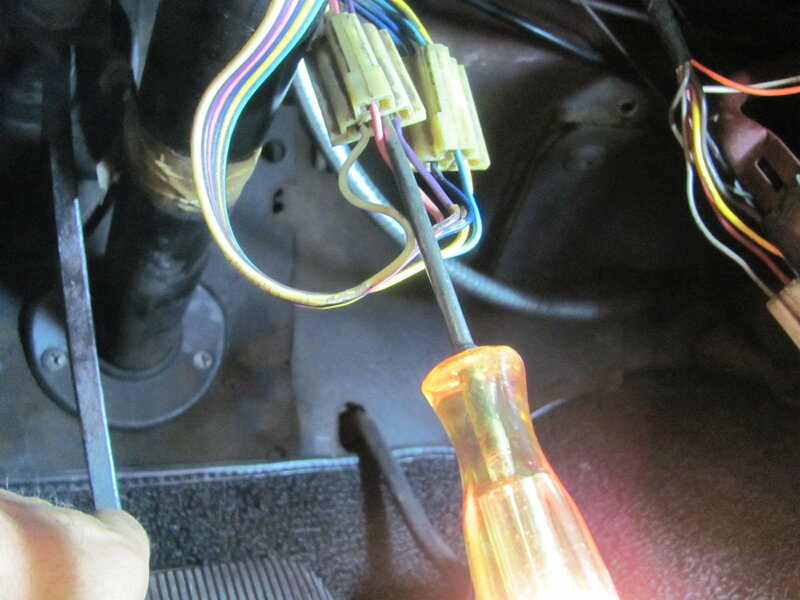 If I am doing a lot of testing I run a jumper wire from the fuse panel to the white wire on the connector, this way you do not have to keep the pedal depressed. First check the switch side for power and then the harness side. If you have power at one side and not the other then you have a bad connection. If you do not have power at the switch side then the switch is bad. If you have power at both sides then it is somewhere in the harness going to the rear of the car. Here is the colors and where they go. Wiggle the turn signal stalk, and hit the brakes. See if the stalk is not returning to "center". Common issue with the C1 turn signal switch. If that is your issue, then we can go from there. I will probe in the morning. I know this........I have to hold turn signal lever up manually or down manually to have signals work? Could this be the problem, And would this be the turn signal switch or the cancellation switch? So I couldn't wait and this is what I found. I have to play with the plunger on the Brake light switch to have power coming out of switch........will be replacing. Lights flicker and both sides will come on and stay. So If I recall correctly I need to draw a box on a piece of paper and label in the box what wires go where and remove them from the turn signal harness connection that exits the column. Then hook a pull wire to them and pull them up thru the harness. And screw down switch up top...........correct? Is there a separate cancellation switch or is it part of the turn signal switch? Turn signal switch is simply not returning to center, if one or the other brake light is not staying on, and when stalk is held in the exact center, they are both are on. In most cases this is a problem with the mechanical portion of the switch (not the switch itself). There is a flat spring that bears on the mechanism, that I had to shim to make it stiffer, in order to keep mine returning to center. Look at this great video for more info. The flat spring I mentioned above is at 6 min. 18 sec. Last edited by Plasticman; 04-18-2018 at 10:21 PM. I'm going to tear mine apart before I order new parts. I have to hold my Turn Signal Lever down or up ,The Lever will not stay by itself.Im wondering.........If the split washer that goes on the Pivot Pin is missing and its tightened down to tight?????? Regardless just knowing my problem lays here is a blessing. Very simple to fix,If I have to shim the flat spring.......How is that done? Here are several articles on the C1 turn signal system....fix your original stuff if its at all possible. The repro stuff is not optimal. I remember I flipped it over (it had taken a "set", and was stiffer in the opposite direction). But also think I added some thin steel shim stock (think beer can thin) under it at the 2 ends, to effectively make it stiffer. I completely agree with Frankie, that you should try to reuse the original parts, and that the repro parts are crap!